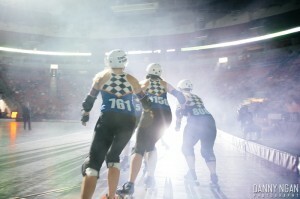 It was a battle between the upstart team that believed it could win and the old guard who has a hold on three straight league championships when the Rat City Rollergirls Roller Derby opened its 10th season at KeyArena last Saturday night. While maybe not an upset (coaches in the league will tell you that the four teams are not all that different in talent) the win by the Derby Liberation Front, 223-190, over Grave Danger served notice that no bout will be a gimmie this season. DLF made their statement in the opening jam, jumping out to a quick 28-0 lead. Jammer Bam! !B, newly recruited this season after turning 18 and becoming eligible for the women’s league, followed solid blocking and crushing line play and scoring big in this game. DLF didn’t show weaknesses over the next few jams either, building their lead to 72-28 with 11 minutes remaining in the first half. Rumble Fist was a wrecking ball against the best efforts of Danger’s best jammers, a crew known for their scoring efficiency. Fist made sure they were inefficient, constantly throwing her body in DLF of the Danger jamming machine, plugging the holes and preventing jammers from passing. But Danger didn’t win three straight championships without a bit of inner steel and slowly blockers began to establish themselves, jammers began to fight through for scores. Picking up points a few per jam Danger pulled ahead at jam 20 with 1:33 left in the first half and led 96-93. Turns out that DLF had some steel of their own, this time in the form of jammer Muscle Sprouts, who rammed through a quick 10 points to give the lead back to the DLF, 103-96. The return of Bam! !B to jam the last round, which started with three seconds left in the half, could have led to a quick call off for two very tired teams. Instead Bam! !B added nine more points and her team left the track ahead 112-96, 48 of those DLF points belonging to Bam! !B, another 28 to Bill F. Murray. 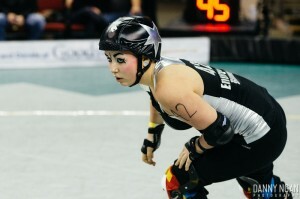 Murray was picked by her opponents as the Most Valuable Player for the bout for the Derby Liberation DLF. She returns this year after being out the entire last season following a hip injury. 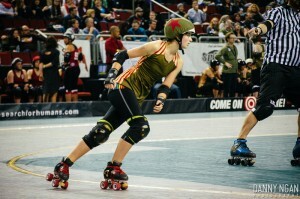 K. Breezy had 41 points as lead scoring jammer to lead Danger. The final 30 minutes of rough stuff between the Danger and DLF began as a game of strategy. Quick points were accumulated by DLF in lieu of scoring onslaughts. Leads changed regularly and nobody was leaving the arena. At 20 minutes left to play Danger was on top 137-126. Bam! !B helped DLF close the lead they had relinquished, and, by the three minute mark, Danger’s margin was a nail biting two,184-182. Then The KZA, another bullet in DLF’s arsenal of jammers, muscled her way around frantic Danger blockers to put the DLF back ahead in jam 22. At 1:40 the score was 192-184. K. Beezy broke through DLF’s blockers on the next jam but was stopped by Full Nelson before she could pick up any points. Danger Coach Vito Ramon called a time out. Fifty three seconds remained in the bout and 8 points separated the two exhausted teams. Carmen Getsome, another of Danger’s efficient jammer crew, set out to reverse that lead when the whistle blew starting the final jam of the night. She came up on the DLFs blocking line with a fake to the right outside shoulder of the outside blocker. When that blocker moved to stop her Getsome crashed through to the left, breaking free and racing around to begin scoring points. In the confusion of blockers and movement of the pack Getsome was bounced off the track. Coming back in too soon she was penalized for an illegal track cut setting up a power jam for DLF. Her trip to the penalty box assured that the DLF, who said they entered the bout fully believing they could win, did exactly that. Dahn said that he believes, when he has the full complement of four blockers on the track, nobody can touch his team. “We have a lot of respect for the Derby Liberation Front,” he added. The first bout of opening night was a night for Missile America, Luna Negra and Enurgizer Bunny to shine. 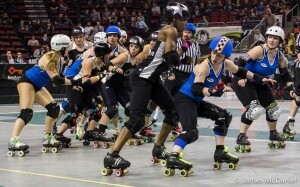 After Miss Washington, Allyson Rowe, sang the national anthem and last season’s champions, Grave Danger, boasted their trophy, the Throttle Rockets set about dismantling the Sockit Wenches in the opening bout. America and Negra, experienced pros, and Bunny, a new junior recruit to the Rockets, blew the doors open early in their bout against the Wenches. The 18-year-old Bunny’s recent birthday made her eligible to play in the league and she established herself immediately, breaking out of the first jam half way around the first lap. She blew by Wenches blockers to begin scoring, picking up the fifth point when Sun Shiner hipped her to the outside, squeezing her along the track edge in a battle of wills over who passes and who gets dumped. Bunny held the edge, passed and soon had the Rockets ahead 18-0. Negra and America epitomized the Rockets game for the night early in the second half when America was the only blocker between the Wrenches’ jammer Penny Racer and an open lap to points. Racer went outside with a burst of speed. America went outside with a piston slam of her right hip and Racer met the track with a profound thud. Without missing a second, America grabbed Negra’s hands and flung her ahead of the pack on her way to picking up 5 more of the 97 points she scored for the bout. The final score of 219 to 128 may be the most accurate reflection of the sort of night each team had. Rockets Coach Slutnik and assistant Lexi Luther both were effusive in explaining that their team just played much better than either coach had anticipated. “Everyone worked hard. They all brought something,” said Slutnik. They brought too much for the Sockit Wenches. “We have to put in some more work,” she said.